An occasional series on the foods less travelled-with … the Australian native foods, the weeds, the very old and the very new. Hello, I’m Fiona, and I’m a foodie neophile. Unexpected pleasures of nettles, warrigal greens. Honestly, I actually have a principle of “don’t eat something that bites you first”. 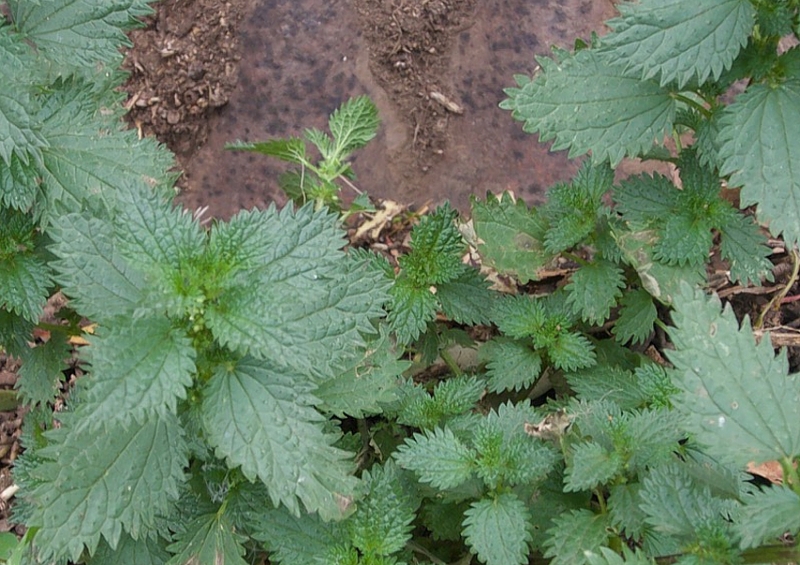 Nettles are premier among those plants. Their leaves are covered in little spikes that sting like the blazes and bring the susceptible among us out in welts. They have been an important source of greens for humans the world over for millennia, probably due to their habit of growing practically everywhere. Their bright green leaves are rich in a range of nutrients, particularly plant-based iron, and they grow in whatever small pocket of nitrogen-rich soil they can find. Which probably explains their presence in my chook pens. In fact, they’re native even to Australia. Our variety here is apparently smaller-leaved and a bit more intense in sting, when compared to the European varieties, and it’s accounted that the Indigenous Australians were eating them well before Europeans set foot on the island. They are also an excellent compost activator (as is comfrey) – pull them out and add to composts to help other components break down more quickly. They are regularly recommended as a good poultry feed. If someone could tell my chooks, ducks, and geese about this, I’d be most grateful. Note: when picking nettles, do it as young as possible, wear good gloves, and discard the roots. If I am going to eat nettles, I’m going to cook them first, to disable that sting. Traditional uses are in a bright green soup, or blended into the water when making pasta by hand, for a rich green pasta. The following recipe comes from Gardening Australia’s Jerry Coleby-Williams, as a simple, effective nettle soup for 2–3 people. 3 medium potatoes (or equivalent in cocoyam or taro) to thicken the soup. Peel and dice potato, then boil until soft. Drain and set aside. Chop onion and garlic, and lightly fry in melted butter until just soft. Add to potato. Bring stock to the boil, add nettles, and bring to the boil again. Simmer nettles for two minutes. Strain nettles from stock and add them to potato mix. Puree the nettles and potato mix, then blend the puree thoroughly back into the stock. Bring back to a simmer. Serve into soup bowls. Add one teaspoonful of sour cream per bowl, garnish, and serve with bread rolls. > Original recipe found here. Latin name: Urtica incisa (native to Australia), Urtica urens (introduced from Europe. Common name/s: Nettle, Stinging Nettle, Scrub Nettle, Tall Nettle. General use: Rich source of iron and other vitamins for human consumption. High in nitrogen, so good in composts. Nettle tea has some therapeutic uses. Poultry feed. Growing tips: U. incisa is a perennial; U. urens is an annual. I’ve never found any need to deliberately plant them in the Canberra region; one or the other, or both, seem to turn up quite cheerfully on their own, and the main trick is removing them from the places you don’t want to be randomly stung. A page on “Toowoomba Plants” has an excellent overview of the difference between the native and introduced varieties. One of my favourite plants, due to its range of positive virtues in the kitchen and garden. It’s a highly-adaptable groundcover that naturally grows on sand dunes around Australia’s coastline, but readily naturalises in an amazing range of environments, including the local dry, acid, shallow, clay/shale soils. It appears to have no significant insect pests – a major advantage over English spinach – although cabbage moth caterpillars will often attempt to eat it. Once. It generally grows no higher than 30-50cm high, but can inhabit over two metres of ground space with its long, succulent tendrils. It likes to scramble up and over upright structures like walls, trees, shrubs, and garden beds, making it suitable for hanging pots or containers. This scrambling habit makes it an amazing living mulch, keeping the soil – or plants – underneath cool, damp, and shaded from extreme weather such as frost, wind, and sun. If you need to clear a warrigal green patch, it’s remarkably easy. Trace the vines back to their central root, which will be amazingly short – barely 10–15cm in length – and pull them out. Throw the heavy armful to your animals. It’s adored by goats, chooks, ducks, geese, and guinea fowl (just to name the animals that decimate it here). Note that the dropped seeds will re-germinate in about 3 months’ time, meaning you’ll never be without greens, and the seedlings will pop up in the oddest locations. I tend to just leave them where they grow unless they are seriously in the way. Its historical past is recorded in the name “Botany Bay Greens” (or spinach). The crew of the Endeavour collected the leaves and used them to stave off scurvy; most likely identified to them by the local Indigenous people. Joseph Banks took the seeds back to England with him, where they were cultivated in Kew Gardens, and then spread to France – to the extent they are apparently now regarded as a French vegetable! Use anywhere you might use spinach. The main thing to remember is to blanch it before use, to remove the high level of oxalites – oxalic acid – in the leaves. This can be easily done by chopping the leaves (or leaving whole), placing them in a bowl, pouring boiling water on top, and leaving for 1–2mins. Drain the water. Don’t re-use for any cooking purposes, but it’s fine on the garden. The greens will still have a nice crisp lushness to them, but without the “bite” at the back of the throat. A good trick is to throw the whole or sliced leaves in with your cooking pasta for the last couple of minutes, before you drain the pasta, and then add your pasta sauce. Works with anything, even creamy sauces or rich meaty ones. My favourite recipe is one of the simplest – “an omelette and a glass of wine”, as per Elizabeth David’s 1984 collection of writings. Serves 1–2 people. boiling water for blanching the greens. Strip the leaves off the stem, avoiding any seed cases. You can use the top 5–10cm of the stem if you like. Chop the greens roughly and place in a bowl. Pour boiling water over the greens and leave for 1–2 minutes. Chop any additional herbs to be added to the omelette. Crack the eggs into a bowl and whisk well. Add salt and herbs. Drain the warrigal greens and manually squeeze any extra water out of them. Add greens to the eggs and beat until they separate somewhat. Add grated cheese and stir well to incorporate. Heat a small heavy-bottomed frypan to a medium heat. Grease with a little oil or butter. When the surface has almost set, but is still a little liquid, fold half the omelette onto itself and slide on to a plate. It will continue cooking in its own heat. This is the trick to avoiding rubbery omelettes. Eat immediately – ideally with a glass of a nice cold wine! Or freshly-squeezed orange juice, if with breakfast. Note: never, ever let an omelette sit before eating. It must be eaten the moment it’s served. Elizabeth David was extremely firm on this point. Common name/s: Warrigal Greens, New Zealand Spinach, Botany Bay Spinach, Tetragon (in France), Summer Spinach (in England). General use: As a substitute for spinach in savoury dishes in cooking. An excellent groundcover and living mulch. Well-liked by livestock including poultry and goats. Growing tips: Will naturalise readily in a range of conditions, although the naturally tropical varieties may take a couple of seasons to develop a frost-resistant variety if transplanted. Self-seeds extremely readily, if slowly, once established; can almost become weedy under ideal conditions. Prefers a dappled or completely shady location with regular access to water; this will give the biggest, most lush and tasty leaves for human harvesting. However, will actually grow in extremely hot, sunny, exposed areas, and as such can be used to help develop soils in marginal locations. Does not transplant well over about 20cm in height, like most natives; transplant when the first two seed leaves appear for best results. I have never needed to consciously water or fertilise my plants in the Tarago region, and they appear to have very few, if any, insect pests. Seedlings are often found in nurseries, particularly native ones. Seeds can be found through specialist online nurseries such as Eden Seeds, Green Harvest, or Digger’s. Bent Shed Produce stocks both seeds and seedlings in season. All ingredients are sold, in season, through Bent Shed Produce.